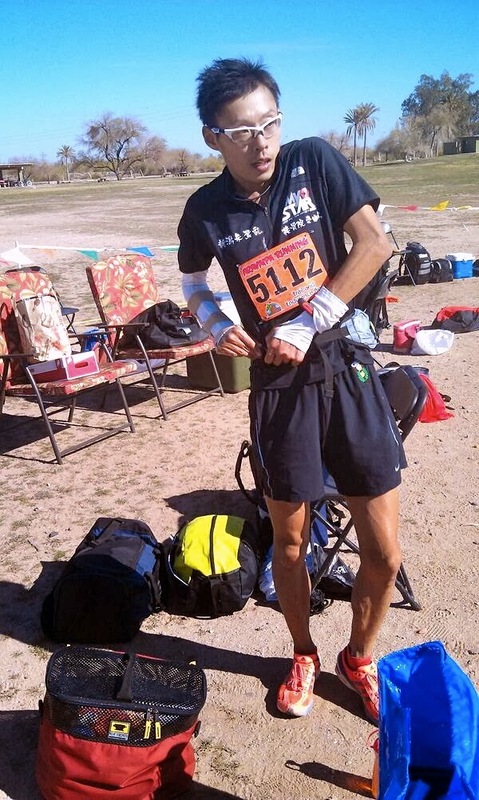 14:16 / 29:44 track runner Tsutomu Nagata, 29, took up ultramarathons after an accident in 2010 left his right arm permanently handicapped. In 2013 he finished 3rd at the Lake Saroma 100 km in 6:44:33, a time that ranked him 6th in the world for the year. Nagata made his 100 mile and international debut Jan. 25 at the Coldwater Rumble 100 Mile Trail Run in the U.S., leading for the first two 20-mile laps before being overtaken by eventual winner Catlow Shipek (U.S.A.). Post-race he wrote about his experience. To begin with I'd like to thank Iwamoto-san and Rina-san from Club My Star for first suggesting this opportunity. Also to everyone in Tokirun, Igarashi-sensei, Seki-sensei, Ota-san and others who supported me, I don't know how to thank you enough. The race started at 7:00 a.m. on the 25th. At first there was a pack of four, but it quickly became just two of us. Him: (^-^)/ "Hi! Blah blah blah blah." Me: (T-T) "I don't speak English. Sorry! Sorry! Sorry!" Him: (^-^)/ "What's your name?" He went to the toilet at the end of the first loop and I took the lead. On the second lap the sun started to shine and it got so hot that I couldn't believe it was really winter. There were three aid stations per lap with great cheering and support, and I really appreciated the staff's efforts to understand my poor English. In the second half of the third lap I started slowing down and the guy caught back up to me (although I think I was the only one thinking of it as being caught). When he caught up to me he asked, "Nagata! You doing OK?" I could tell from the difference between his positive way of thinking and mine that he was very strong, but I couldn't give up then so I chased after him. On the fourth lap I was going as hard as I could trying to close the gap since there were people who were looking forward to seeing how I did. I was feeling like, "Hey, jackass! Wait up!" I wonder what the gap between us was at the end of the fourth lap? I was going through pain and agony I'd never tasted before while I was chasing him. The fifth lap took an hour longer. On the fifth lap I used a headlamp for the first time and ran through the darkness. I crashed into cactuses, fell lots of times, took wrong turns, and the headlamp died. I encountered a million problems, but somehow I got to the finish. 100 miles is a very long way. If I was told to run it all by myself it'd be impossible. Every person I lapped, saying "Good job!" to each other gave me strength. I felt a new world in this race and became a new person again. I find enjoyment in this through seeing my own growth and change. That's my style. Thanks to Rina-san's translation, after the race I was able to talk a lot to that guy I met there in the States. I think there are great races and great race staff in Japan too, but my words are insufficient to express how much I felt that there was an incredibly exciting world waiting just a step outside Japan. When I get back I want to talk about all this over some drinks. I'd like to talk more to other people who are interested in ultramarathons. Update: Read Catlow Shipek's account of the race here.